Protecting our electronic resources is an ever increasing national and international concern. Through the Maryland Cybersecurity Center (MC2 – www.cyber.umd.edu) researchers in computer science, engineering, physics, and mathematics are taking advantage of our close proximity to the leading government and private industry experts to prepare the future cybersecurity workforce and develop new, innovative technologies to defend against cyber threats. The curriculum is designed to cover fundamental and applied topics in Cybersecurity Applications, Operating Systems, Networks and Protocols, Network Security, Information Assurance, Network Intrusion & Detection. The student will then customize their educational experience according to their individual needs by selecting from electives in Secure Software Testing & Construction, Security Tools for Information Security, Digital Forensics & Incidence Response, and Reverse Software Engineering. Additional electives courses through the Software Engineering, Systems Engineering, and Reliability Engineering programs are available to round a student’s academic program. 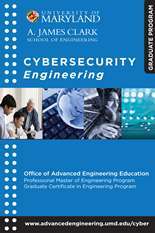 The advent of this program comes at a time when practicing scientists and engineers are needed in the rapidly developing field of Cybersecurity. The program allows working professionals the opportunity to develop their current knowledge through a highly focused/technical curriculum without leaving their current full-time positions. Students within the program will receive instruction from the University’s foremost scientists in the various areas being developed in cybersecurity as well as experts from the public and private sectors.